In the year 1700, Corelli published his violin sonatas op.5, whithout any doubt the most important collection of instrumental music of the beginning of the century. 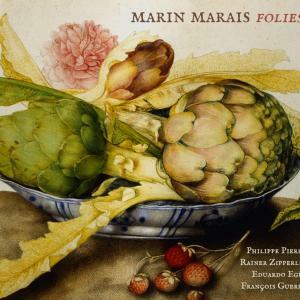 One year later, although he admits that this new publication was long-time overdue, Marin Marais publishes his “Deuxième Livre de Pièces de Viole” where one finds, just like in Corelli’s op.5, several variations on the famous theme of “La Follia” or “Folies d’Espagne”. The French violist reveals with force the variation, refinement and passion of his art and in his writing one distinguishes the typical French accent impregnated into the Iberian theme. In addition to these famous “Folies”, this recording enables us to discover two suites in A major and E major, an unusal key for the viol, where one finds a very nostalgic and beautiful “Pavane selon le goût des Anciens Compositeurs de luth”.